Another Nail Polish Get-Together (part 1) - Polish This! 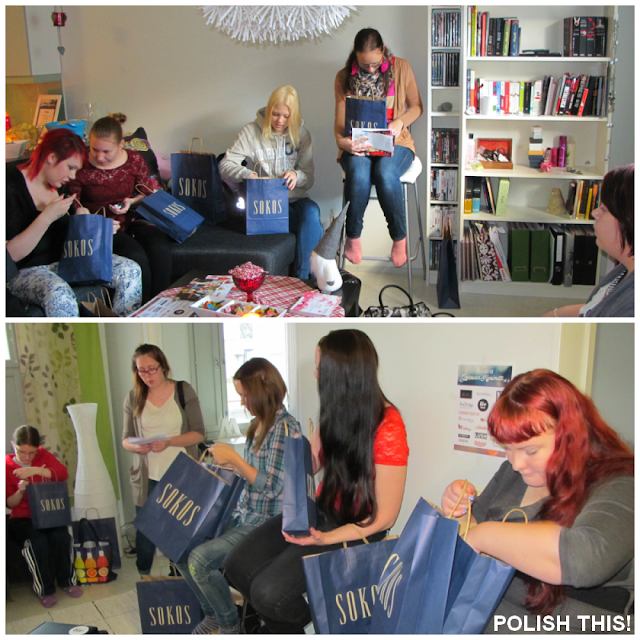 On Saturday I participated in another meeting with some fellow nail polish bloggers and enthusiasts. 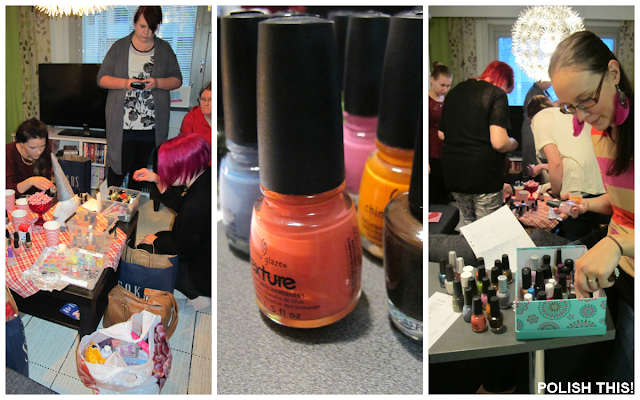 I have to say that I really love these events and getting together with people who share my love for nail polish. We have had three meetings already before this (two at my place) and this time Misify opened her doors for the group of 15 ladies. 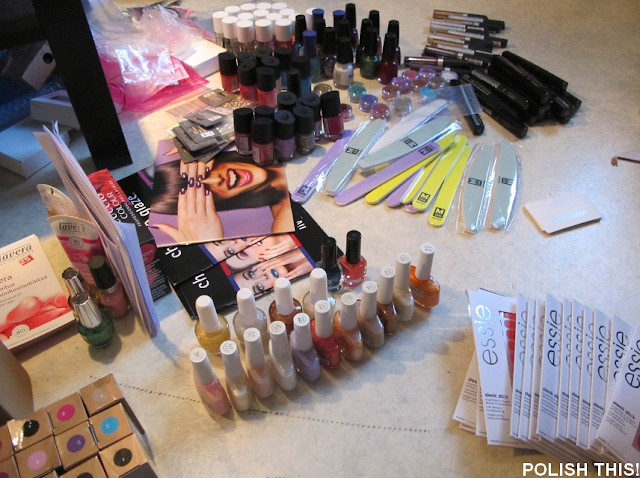 It was so much fun to see those familiar faces again but also to meet some new nail polish lovers! Before heading to Misify's place couple lovely ladieas from a local department store called Sokos gave us an one hour beauty presentation, but I'll tell you more about that in another post in order to keep this at least somewhat short. 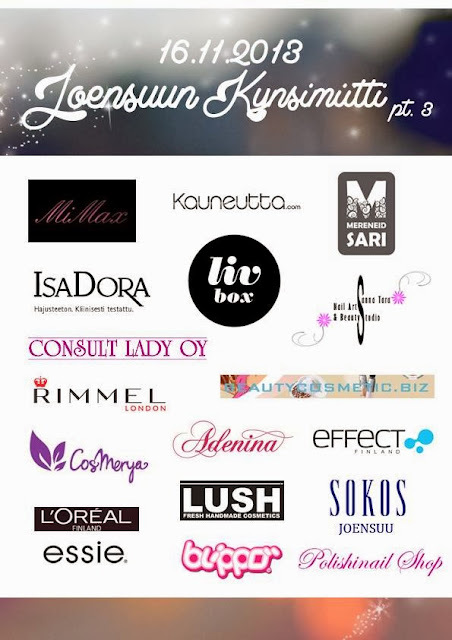 I had the great pleasure of organizing the event with Misify and Katjamaria, and couple days before the meeting we fixed up goodie bags for all the participants from all the sponsor products that we had gotten and also little presents for all too. 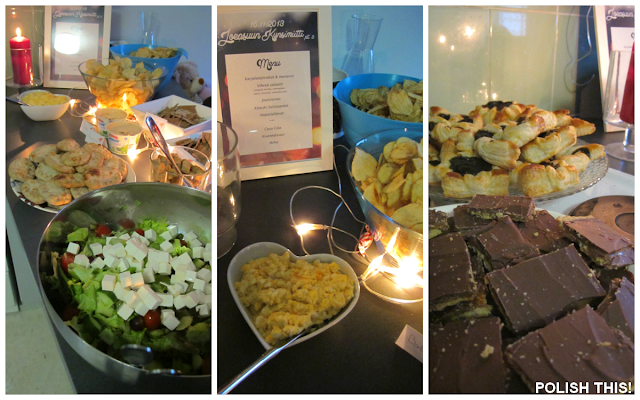 We actually had a little Christmas theme for the event as it's already quite close to Christmas, so those presents and all the decorations were made to fit the theme. 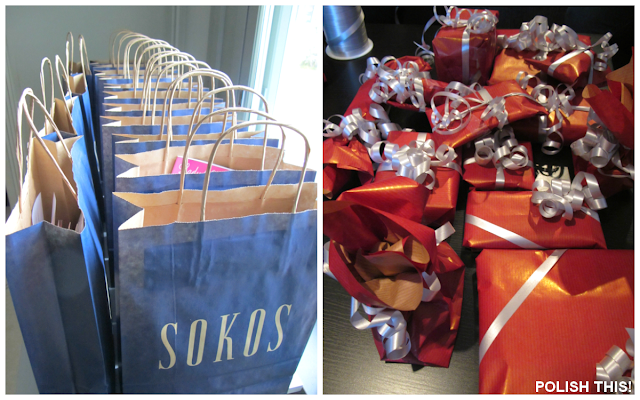 So we started the event with a little informal introduction round, then we gave everyone their goodie bags. I'll show you in another post what I got from mine! Then as usual everyone had bought some nail polishes and nail art stuff with them and we swapped and sold those to others. I manage to sell few polishes, but I also bought some.. I'll show you those in another post as well. We had hoped that everyone would decorate their nails according to the theme, so we all had some Christmas/winter inspired nails. We had a little competition too and everyone voted who they thought had the prettiest nails. The prize went rightfully to EliZaaa's red and white nails which really suited the theme perfectly! I think we all had a great time or at least I did and like I said, I love these events! Time went by really fast and as there were so many people participating it was impossible to get to know everyone, but I hope everyone had a blast and thanks to everyone who participated!I hope that we can have another one of these events in the future too. Lastly I wanted to share a behind the scenes picture with you guys. This was when we were fixing up those goodie bags and the present for everyone. Lauantaina meillä oli siis täällä Joensuussa jälleen kerran kynsibloggaajien ja -harrastajien miitti. Miitti aloitettiin Sokoksen järjestämällä kauneustunnilla, josta kirjoittelen enemmän ihan omassa postauksessaan. Kauneustunnin jälkeen siirryimme yhden bloggaajan kotiin, jonne olimme järjestäneet kaikille osallistujille goodie bagit, pienet lahjat ja tietysti hyvää ruokaa. Ruoan ja goodie bagien lisäksi miitissä järjestettiin myös mm. kynsikilpailu, jossa kaikki saivat äänestää suosikkikynsiään ja tietysti kirppistelimme myös perinteiseen tapaan. Miitti sujui ainakin omasta mielestäni mukavasti ja toivottavasti myös kaikilla muilla osallistujilla oli hauskaa! Tietysti noin suuressa ihmisjoukossa ei valitettavasti kerkiä kaikkiin tutustua tai edes jutella kaikkien kanssa, mutta silti oli taas kerran mukavaa tavata niin vanhoja tuttuja kuin tietysti uusiakin. 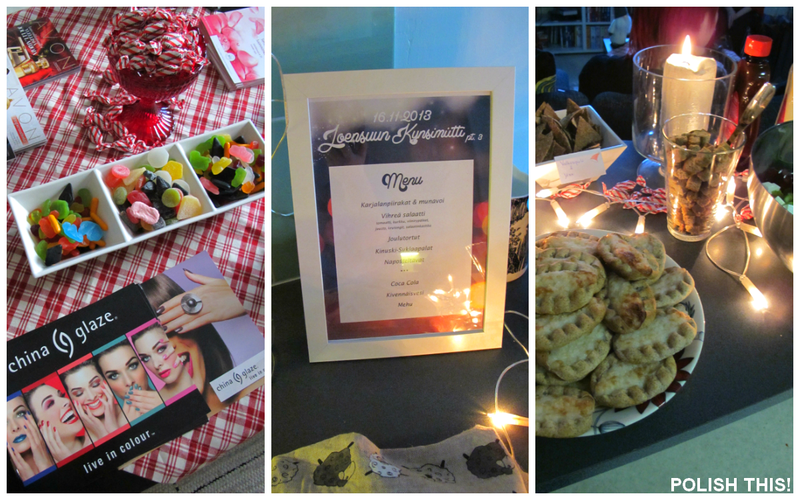 Omasta goodie bagini sisällöstä, miittikynsistä ja myös siitä Sokoksen kauneustunnista kirjoittelen vielä erikseen postaukset, joten pysykäähän kuulolla.